Is Your Virtual Machine Optimized? Need a better performing virtual machine? Do you work on the Windows side more often than on the Mac? Let me guide you through a few built-in settings in Parallels Desktop that will have a positive impact on your VM performance. To access Optimization settings, Option-click (Alt-click) the Parallels icon in the upper right menu bar, select Configure and go to Options → Optimization. Alternatively, you can use any of the methods outlined in this KB article. Now let me go through each optimization option in more detail. 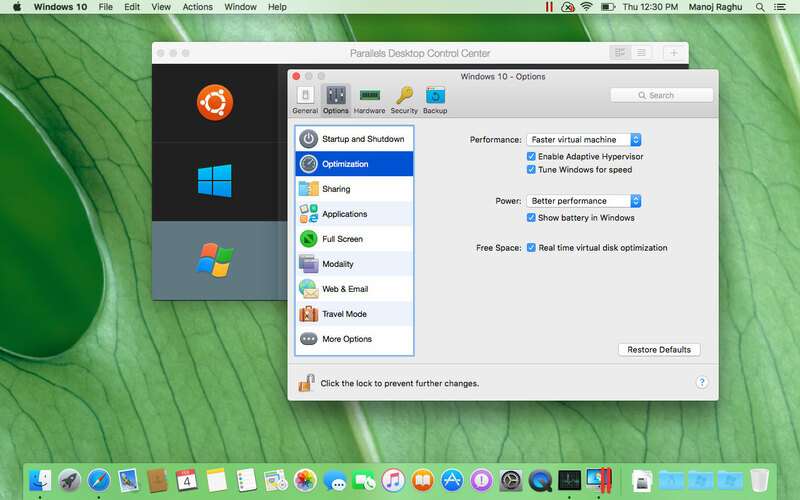 Faster virtual machine: More of your Mac resources will be dedicated to Windows. The performance of Windows programs may be increased significantly, but there will be less resources available for the Mac applications. Faster Mac: More of your Mac resources will be dedicated to Mac OS X. The performance of Mac OS X applications (while you run your VM) may increase and Windows programs may slow down. To set Parallels Desktop to automatically optimize performance for Mac OS X or Windows depending on which application or program you’re working with at the moment, you can Enable Adaptive Hypervisor. When you’re using a Windows program, more resources are given to Windows, and when you’re using a Mac OS X application, more resources are given to Mac OS X. Sounds pretty straightforward, right? For this feature, all you need to do is to select the Tune Windows for speed option. Some Windows features that tend to slow down performance, such as animations during startup, will be disabled. Longer battery life. If you have a portable Mac that you often use unplugged, you can choose this option to lower down power consumption. This may slightly reduce Windows performance. Better performance: This option (selected by default) maximizes Windows performance, but uses more power. In most cases, the space that Windows takes up on your hard disk expands as you add files and other data. But what happens when you remove data? Select Real time virtual disk optimization to set Parallels Desktop to automatically reduce disk space as you delete files. Congratulations! You’ve just optimized your VM! If you still think your VM isn’t fast enough, check out this blog post we wrote about virtual machine myths, which has more information about VM performance enhancement. I hope you enjoyed this post, and don’t forget to follow the Parallels Support team on Twitter!